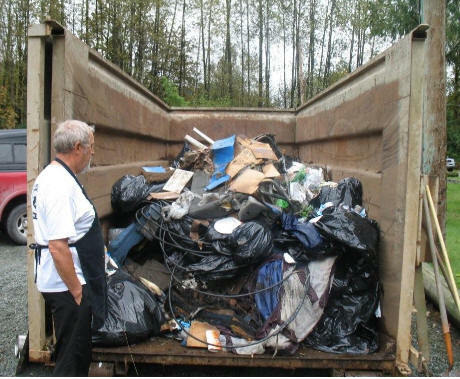 A proud mom and her brood were kind enough to stop for a photo in a fall cleanup September 2012.
his is a friendly reminder about our upcoming cleanup on Saturday April 22nd at the Great Blue Heron Nature Reserve (5200 Sumas Prairie Rd, Chilliwack). Registration opens at 8:30am. Please remember to bring appropriate clothing and footwear as this is a "rain or shine" event. We also encourage you to bring a reusable travel mug and/or water bottle to eliminate the single- use cups. If you bring your travel mug or water bottle and show it to us at registration your name will be entered into a draw for a Tim Horton's gift card! We are very appreciative of the folks at Tim Horton's and the Chilliwack Water Store for providing the refreshments. We look forward to seeing you on April 22nd! 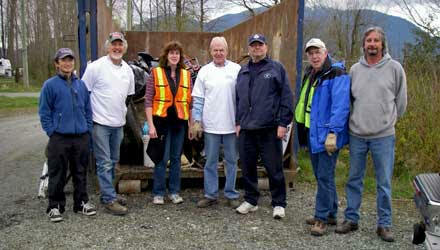 Connect with the Chilliwack Vedder River Cleanup Society on FB at www.facebook.com/cvrcs or via e-mail here.